Are your kids cashed up? My older two got some money from family members for Christmas and are still plotting ways to save/spend it. A national survey shows that nearly 90 percent of six to 13 year-olds got cash for Christmas, with over 60 percent pocketing $50 or more. When asked what they intended to do with the money, around 40 percent planned to put it in the bank, while 30 percent were saving for a big item, such as a bike. How about your kids—are they savers or spenders? In another survey, it was found that 74 percent of Aussie kids have savings. Their combined personal wealth is estimated to be $653 million or an average balance of $285 per child. Unfortunately, the distribution is highly uneven with over 20 percent having less than $50 and around 10 percent having $1,000 or more. There are lots of different ways to teach your kids about money. You could encourage yours to put a proportion of their Christmas and birthday money in the bank or ask them to help save towards the things they want. Another idea is to divide pocket money into three different groups: saving, sharing (buying gifts for others) and spending. With really young ones, it can be as simple as using a jar for loose change. Over a quarter of kids report having no savings at all, which means they’re missing out on the opportunity to create positive money habits during their important, formative years. That can be overcome as simply as giving a child a piggy bank or opening a bank account for them. 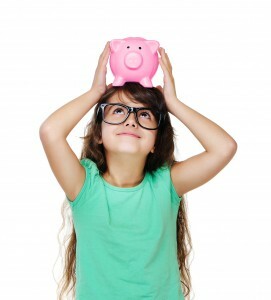 Most banks offer juniors savings incentives and no fees. The most important thing is to talk with your kids about money. Budgeting is a great family-friendly topic because it doesn’t matter whether you’re talking about budgeting for a holiday, school supplies or your weekly food shopping—the principles of good money management are always the same.